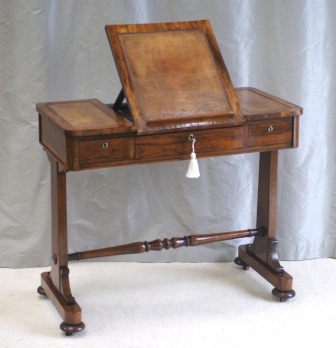 Superb small Antique William IV Library Table in Rosewood. Excellent colour and proportions. c1835. The top having three insert leather panels and a rising centre section over three frieze drawers to the front and three dummy drawers to the rear. The whole on end supports and a turned stretcher and turned bun feet with original castors. Working brass locks with key. Copyright � 2019 Antiquedesks.net - All Rights Reserved.